I’m ushered into The Tiffin where guests are taking their seats before the start of the preview of the Ramadan buffet, themed Semarak Rasa Ramadan. I like the open-plan layout of this restaurant where at a glance, I can see the buffet laid out mainly on a central island, and that Executive Chef Arthur Lim and his culinary team are putting on the final touches to the spread. Several stalls are set up at the restaurant entrance, serving whole roasted lamb, traditional Soup Gearbox and Ayer Batu Campur or ABC, a local shaved ice dessert. Chef Arthur Lim tells me that this evening, the menu in the hot buffet is Nasi Arab with its complementing dishes like Lamb Shank Stew and Harrisa Potatoes. This menu will be served in rotation among five menus including Nasi Kerabu, Nasi Tomato, Nasi Ambeng and Nasi Tumpeng, each type of rice with its complementing dishes to showcase their pride of delectable Ramadan dishes to discerning diners. In the tradition of buka puasa, there is a selection of appetizing kerabu, fresh garden greens as well as ulam-ulaman that are complemented by a choice of local sambals and Western dressings, to whet the appetite. As more guests arrive, they are invited to help themselves from the buffet and I discreetly hover nearby to observe how they are appreciating the spread. With many diners making a beeline for the baked seafood, I soon realise that this is one of the highlights in the menu. To savour, diners pick their choices of marinated split whole prawns, whole squid and whole fish wrapped in foil, and drizzle Ayer Assam sauce over the baked seafood. Seated at the table with me are a couple, Syakirin Ahmad and his wife, Noorfaieza Abdullah, and I cannot help but notice how they are systematically helping themselves to various items from the buffet. I like how they relish the Lamb Shank Stew on Nasi Arab, sticks of satay with its condiments and other dishes, one after the other. It didn’t take long for us to strike up a conversation, so besides getting to know each other, I can also hear their comments about the food. At the Dessert section, I’m introduced to Pastry Chef, Korniea Elis, a young lady who, I’m told, is skilled in baking a range of cakes and pastries. To find out, I help myself to her signature Blueberry Cheesecake, Yam Layered Cake and Moist Chocolate Cake, while I remind myself to keep some space to slowly savour them. Among the range of local kueh, cakes, cookies, pastries, puddings, my nose tells me that there are durian desserts here and I quickly spot the Durian Crepe and Durian Mochi. I help myself to a variety of fresh local fruits and remember that Chef Arthur said that I must sample their tasty own-made Sugee cookies. The sumptuous spread for Semarak Rasa Ramadan at The Tiffin will be served from May 6 to June 4, priced at RM118 nett per adult and RM58 nett per child aged from six to 12 years. Early bird special deals for the buffet from now till May 6 are priced at RM98 nett per adult and RM48 nett per child aged from six to 12 years. Enjoy Group deals when you buy nine vouchers (adult), one is for Free. Or take advantage of Family Packages for six paying adults, two children dine for Free. Sahur Buffet is also available from May 6 to June 4, served from 4am to 5.30am, priced at RM42 nett per adult and RM22 nett per child aged from six to 12 years. The Tiffin is at the lobby level of Impiana Hotel Senai, located at Jalan Impian Senai Utama 2, Taman Impian Senai, 81400 Senai, Johor. For enquiries and reservations, Tel: +607 – 595 2003 and +6010 825 4001 or email to: fnb1.ihs@impiana.com. For more info, visit website: www.impiana.com. A treat fit for Princes and Princesses: this is what the Puteri Pacific Johor Baru has arranged for diners in their Sajian Puteri buffet at The Puteri Café this Ramadan. I’m at the preview of Sajian Puteri, the brainchild of the culinary teams led by Chef Zamri of The Puteri Pacific Hotel and Chef Zainuddin of Persada Johor International Convention Centre. Besides enjoying more than 100 dishes in the best of traditional and international favourites in this buffet, diners can stand to win attractive prizes in a special lucky draw. Curious about this attractive treat, I ask about how this works and am told that diners only need to submit their dining vouchers along with their names and contact details. After Raya the results will be announced on social media and the lucky diners may win return flight tickets to domestic and Asean destinations, while its top prize is an Umrah Package. On four specific dates, Centre for diners to enjoy their breaking-of-fast dinner while being entertained by the favourite Sajian Puteri will be served at the Persada Johor International Convention their artistes in Berbuka Puasa with Artistes. 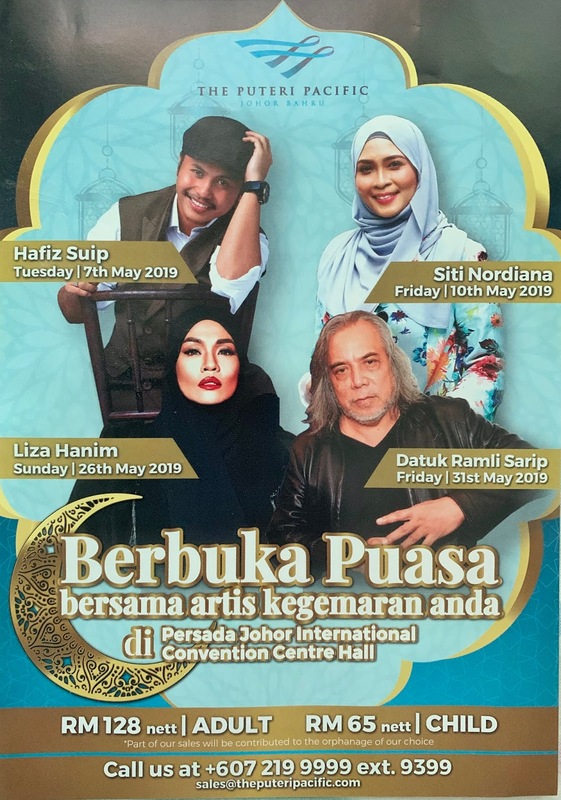 As a special treat to break-fast with their favourite entertainer, diners can make a date with Hafiz Suip (May 7), Siti Nordiana (May 10), Liza Hanim (May 26) and Datuk Ramli Sarip (May 31). In addition, diners can look forward to enjoying a Daily Must-Try so keep an eye out for this daily change at one particular stall to discover if it’s Chinese, Indian or other cuisine, served in a freshly cooked 15-cycle menu. Among the featured items served from stalls in this buffet are the Puteri Kambing Kuzi (lamb), Gulai Tulang Rusuk Merah (beef), barbecued seafood and meats, Ayam Percik Salai (chicken) and Roti Kwali Terbalik or bread baked on overturned wok, served with Lamb Qeema. The Lamb Kuzi is a whole lamb stuffed with fragrant basmati rice and roasted with the finest herbs and spices. To savour, I drizzle the rice and slices of lamb with a spot of Kuzi gravy, served from a dish nearby. Chef Zamri is particularly proud of the beefy goodness of traditional brewed soups and stews like Gulai Tulang Rusuk Merah which is served warm from a giant pot or kawah. The foyer outside The Puteri Café is lined with various stalls that serve a range of items like Mee Rebus, stir-fried Char Kway Teow or flat rice noodles, a range of Pasta, freshly-made Roti Canai and Murtabak, deep-fried snacks – including rolls of deep-fried durian – and the Daily Must-Try stall. At the stall for Roti Kwali Terbalik, I watch as the chef’s gloved hand, painstakingly pats a circular patty of dough on a heated overturned wok to toast it. When the white bread turns a shade of golden-brown, it is sliced in half before being served with a side of Lamb Qeema. At the section dedicated to serving dates and a range of preserved fruits, I’m glad to see how each item is stored in covered but see-through containers for diners to conveniently help themselves to their favourite picks. In the hot buffet where cooked food is served to savour with steamed white rice, Chef Zamri emphasized that all the items here are prepared strictly with seafood. He then explains that these seafood dishes are designed to strike a balance with the meaty items in the menu. A quick peek at the contents in the chaffing dishes reveal seafood dishes like Seabass steamed in soya sauce, Squid stuffed with cous cous, Prawns with petai sambal and kum hiong flavoured Mussels. Nearby, an Appetizer section serves a range of traditional sambal sauces to go with a selection of ulam-ulam or fresh kampung greens as well as a choice of tossed kerabu or Malaysian salads. Several jars with air-tight lids are filled with a variety of crisps. Another staple for the breaking-of-fast must be Bubur Lambuk, a traditional rice porridge. At the Dessert section, Chef Zamri proudly tells me that all their local kuih, bubur and pengat or sweet broths, cakes, pastries, jellies and puddings, are all made in-house. I can see tasty choices like kuih lapis, seri muka, bingka ubi, koleh kacang, kuih kaswi and so delighted to spy Lepat Pisang among them because this delicacy is a rare find these days! The Sajian Puteri buffet is served at The Puteri Café from May 6 to June 3, daily from 6.30pm to 10pm. Rate at RM108 nett for adult and RM55 nett for children aged between six to 12 years. Early Bird purchases made before April 30 will enjoy reduced rate of RM88 nett for adult and RM45 nett for children aged between six to 12 years. And for every 10 vouchers purchased, one will be Free. 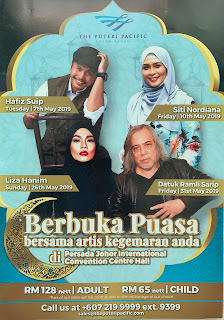 Please Note: The Sajian Puteri buffet will be served at the Persada Johor International Convention Center along with performances by popular artistes on these specific dates: May 7, 10, 26 and 31. Rates at RM128 nett for adult and RM65 nett for child. Enjoy a Special Discount on the Berbuka Puasa with Artistes dinner vouchers when you present a screenshot or a section of the event promotion from any social media or publication platform while making your purchases. Then your special discount will be only RM108 nett for adult and RM55 nett for children aged between six to 12 years. There are also attractive package deals for group events and for hosting Corporate Social Responsibility (CSR) events in the hotel. My first glimpse of the Ramadan buffet at Ponderosa Golf & Country Club this year was from a tiny teaser video, presented in the theme, Sajian Klasik Nusantara. This video features the resort’s Executive Chef Zamani Kidam, better known as Chef Zam, preparing Sup Stew Gearbox, a rich broth of Lamb Knuckles locally known as Gearbox, brewed with traditional herbs and spices and chunks of vegetables, in a style reminiscent of how chefs on the Asian Food Channel would demonstrate cooking! The video ends with Chef Zam (dramatically!) inviting viewers to come savour the sumptuous spread along with Sup Stew Gearbox, in the buffet themed Sajian Klasik Nusantara at Ponderosa Golf & Country Club this coming Ramadan. As Ramadan should start very soon, the resort decided to invite 32 special guests aged between seven and 14, accompanied by their teachers from Sekolah Kebangsaan Kulai, a school that has special-needs children, to dine with us at our media preview. The resort continues their tradition in sharing goodwill with under-privileged groups and they have identified this school which has a Kelas Pendidikan Khas (special education class) to meet the educational needs of children born physically handicapped, have learning disabilities, with Down syndrome or other mental disabilities that impedes learning. “Our school is located in Kulai and we do not receive any invitations for buka puasa, so we are very glad that Ponderosa Golf & Country Club remembered us,” said principal, Puan Rosmayati Hassan. When the buffet spread is ready to serve, it’s time for us to sample the variety of food displayed in stalls and buffet lines arranged around the café and its adjacent terrace. I share the excitement of the youngsters as we take a look at what is being served before deciding on which to taste first. This spread is made up of humble fare in everyday favourites from freshly fried Keropok Lekor, Roti John, Roti Canai to 10 varieties of Malay kuih and an assortment of ice-cream, in a range of menus that will be rotated over eight days. I pause to watch a staff serving Nasi Lemak the old-fashioned way – tastefully wrapped in greaseproof paper lined with a slice of banana leaf (for nostalgic aroma!) – that contains a small portion of rice steamed in coconut milk with a side of cucumber slices, toasted ikan bilis (anchovies) and groundnuts, a wedge of hardboiled egg, a whole fried fish, topped with a drizzle of sambal sauce. This whole fried fish – selar kuning – is a firm favourite (so declared by many in our group!) and I cannot agree more, especially when it’s fried into a fragrant crisp! At this stall there are also bowls of Lontong served with a dollop of the same spicy sambal and freshly-fried Cucur Udang or prawn fritters that taste super when dipped in this sambal. At the terrace, Chef Zam and his culinary team are busy at the Barbecue section, carving the whole roasted lamb and serving smoked Beef, Chicken, Duck and Fish. The smoked fish is Ikan Keli or catfish, best savoured with a drizzle of creamy lemak sauce. Nearby, simmering in a giant pot or kawah, is Chef Zam’s soup of the season, Stewed Gearbox, a slow-cooked, spicy stew of Lamb Knuckles with plenty of vegetables. Besides the chef who is busy grilling pieces of chicken, beef and fish, I can see other chefs stir-frying popular Chinese dishes like Fried Carrot Cake and Fried Kway Teow or flat rice noodles, while another is grilling skewers of satay and yet another is deep-frying chicken. These live cooking stations are under a shelter set up at the terrace for better ventilation as the chefs grill, deep-fry and stir-fry dishes to serve the food, freshly made to diners. I take a peek into the chaffing dishes lined up in the hot buffet and see a range of Malay lemak dishes prepared with rich coconut cream gravies to savour with steamed white rice. There are also irresistible Malay main course dishes like Nasi Ayam Penyet, Nasi Kerabu, Daging Gulai Kawah Batang Pisang, Sambal Sotong Bunga and Ayam Masak Nusantara. The appetizing aroma rises up to greet me as I spot familiar dishes like Paceri Nenas Ala Johor – a Johor specialty cooked with pineapples, Rendang Kambing Tok or grandfather’s recipe for lamb rendang, Labu Lemak Pucuk Manis and Daging Tetel Asam Pedas. Among these items, I recognise popular Chinese dishes like Butter Prawns and Chicken stir-fried with dried chili, contributed by the resort’s popular Chinese restaurant, Hop Sing. In the Salad section, there is a choice of kampung-style kerabu, ulam-ulam or kampong greens like Ulam Raja, Pucuk Pegaga and plump buah petai to enjoy with appetizing traditional spicy sauces like sambal, cencalok and budu. More appetizers to add to the salad combination include salted eggs and salted fish along with a range of crisps and mouthwatering pickled fruits and vegetables. There are also ingredients for diners to assemble and create their own fruit Rojak and top it with prawn paste sauce and a sprinkle of crushed toasted peanuts. At the dessert section, I see colourful Malay kuih and broths like Bubur Kacang Merah (red beans), Pengat Puteri Mandi and this year’s specialty, Chef Zam’s Bebola Pelangi Pengat Pisang (banana)! There are also jellies and puddings and even small cream puffs, and a counter dedicated to Ayer Batu Campur or ABC shaved ice desserts but I notice that the youngsters are making a beeline for all-time favourite, ice-cream potong. It’s good to have these special guests join us for the first taste of the Ramadan spread here and when they have all eaten, the youngsters volunteered to present some songs to entertain. The goodwill continues as these young guests are presented with Raya goodies with the resort’s best compliments as well as cash gifts in Green Packets from a generous donor. The Sajian Klasik Nusantara Ramadan buffet will be served from May 9 to June 2 at RM78 nett per adult and RM35 nett per child aged six to 12 years, comes with entertainment by popular emcee, Embun. Early Bird purchases made before May 8 will enjoy RM10 discount on the adult price. The Café at Ponderosa Golf & Country Club, is located at No. 3 Jalan Ponderosa 1/1, Taman Ponderosa, 81100 Johor Baru, Johor. For reservations, Tel: +607 – 354 9999 (Sales Department). Traditional recipes popular in the Malay states, garnered from the North to the South, will be featured in the breaking-of-fast menus designed in the theme, Citarasa Senandung Melayu Asli, at Tunamaya Beach & Spa Resort, Desaru Coast. I can safely conclude this as I listen to Chef Nazaruddin, better known as Chef Naza, discuss the highlights from over 100 traditional recipes of favourite food collected from the various states that will be served in their Ramadan buffet. While we are in Pawana Restaurant to learn more about these Malaysian dishes that will take diners on a culinary journey throughout the nation, his team is setting up the buffet spread, along with live cooking stations in the adjacent terrace. Among the highlights of this buffet are Nasi Daging Utara, a rice meal served with slices of roast beef to savour with sides of gravy like Air Asam Tomato and Dalcha (lentils), Daging Goreng Halia Madu (Beef fried with Honey and Ginger) and Ayam Percik Bambu Kelantan. As the sun is setting, diners arriving to join us in the buffet preview are being seated at the terrace where they can enjoy a panoramic view of the South China Sea and later, dine under the stars. Diners can look forward to enjoying a range of spicy smoked meat dishes, popular in Negeri Sembilan that include Daging Salai Masak Lomak (smoked beef), Keli Salai (smoked catfish) and Itik Salai dengan Belimbing Buluh (smoked duck). There is, of course, a selection of appetizing kerabu, fruit pickles, fruit rojak, potato salad as well as ulam-ulaman or kampung greens along with fried salted fish that are complemented by a choice of local sambals. I can tell from the long queues that whole roasted lamb Bakar Herba (marinated with herbs!) remains one of the most popular items in the buffet next to grilled kampung-style satay in choices of chicken and beef, served with peanut sauce and condiments. In a quick survey of the stalls set up on the terrace, I spot labels hung up to indicate what food items they are serving. A Goreng-Goreng station serves freshly-fried fritters – made with prawn, anchovies or banana – as well as fried banana, yam and sweet potato slices. Along the same row, I spot a stall that serves Roti Canai, Roti Jala and Murtabak, while another stall is a Soup station that offers a choice of spicy soups – from the sea, topped with Red Snapper, Sea Bass or Mackerel – or from the land, topped with chunks of oxtail, beef, lamb or minced beef (tetel, a Malay word for odds and ends!). I’m glad they also serve the Ramadan staple, Bubur Lambuk, a traditional rice porridge. I watch as diners help themselves from the hot buffet to enjoy steamed white rice with a range of traditional Malay dishes like Udang Kari Mamak (prawns), Talapia Merah Masam Manis (fish), Buncis Goreng Udang Hidup (French beans stir-fried with fresh prawns), Paru Goreng Berlado, Patin Tempoyak Ubi Keladi (fish), Gulai Lala Terung Pipit (mussels) and Ayam Masak Semur (chicken). In the dessert section, there is a variety of warm, traditional sweet broths like Pengat Ubi Keledek (tapioca and sweet potato), Serawa Nangka (jackfruit) and Serawa Durian to savour with steamed glutinous rice. Besides the range of local kueh, cakes, pastries, puddings and jellies, there are cut fruits, ice-cream and a choice of ingredients to create our own shaved ice dessert, Ayer Batu Campur or ABC. Everyone – me included – enjoys thirst-quenching, ice-cold drinks or traditional pulled drinks like Teh Tarik or Nescafe Tarik to complement their Ramadan meal so we can choose from refreshing Sirap Selasih, Bandung Soda with Cincau (grass jelly) and Kurma Juice (dates). Early bird special deals for the buffet from now till April 30 are priced at only RM58 nett per adult and RM40 nett per child aged from four to 11 years. The sumptuous spread for Citarasa Senandung Melayu Asli Buffet at Pawana Restaurant will be served from May 7 to June 2, priced at RM68 nett per adult and RM48 nett per child aged from four to 11 years. For every purchase of ten (10) vouchers, one will dine Free. A view of the terrace outside Pawana Restaurant where diners are helping themselves at the buffet. Pawana Restaurant is at the lower level of Tunamaya Beach & Spa Resort, Desaru Coast, located at Bandar Penawar, 80930 Kota Tinggi, Johor. For enquiries and reservations, Tel: +607 – 833 8805 or +6012 766 9427. For more info, visit website: www.careluxuryhotels.com/tunamaya-desaru. I read the theme for this year’s Ramadan buffet, Buffet Ala Bazar 28 Hari, at Pulai Springs Resort and cannot help feeling curious about what the “28 Hari (Days)” mean. At the outdoor section of the Gleneagles Terrace Restaurant, I come across the label next to tender slices of lamb that are being served with fragrant rice, raita, vegetable dhall and mint sauce, which reads, Kari Kambing 28 Hari. Upon hearing my question, the lovely Charlotte bursts out with polite laughter. Then she explains that the Resort will be presenting their Ramadan buffet spread in six different menus from May 7 to June 3 in a duration that works out to just 28 days! So they decided to add “28 Hari” into the theme. Ah… I finally get it. Now they have not only created more interest but also added some intrigue into it! The culinary team led by Junior Sous Chef Tom, has prepared a wide range of local and international specialties along with the restaurant’s popular picks, served in more than 100 must-have buka puasa dishes here. At a glance I can see that the breaking-of-fast items here range from local salads, pickles, meat, poultry, seafood to barbecue and carving stations, desserts and drinks. I also appreciate how they have put up signs that read: Love Food Hate Waste, to remind diners to be mindful about how they take their food, enough to finish it without any waste. Staff at this stall serves a yummy Asam Pedas Fish! The restaurant has become renowned for their refreshing Coconut Shake, a delicious dessert made popular at Klebang, Melaka, and Johor’s Kambing Kuzi or roasted lamb prepared with the finest herbs and spices to savour with fragrant briyani rice. I remember other Johor specialties like Asam Pedas and Gulai Lemak served from a stall clearly labelled, Asam Pedas Johor dan Masak Lemak Cili Api that are popular choices here. The serving staff at this stall are ready to simmer my pick of fish from a choice of pre-cooked fish like Ikan Pari, Ikan Siakap, Ikan Kembung or Ikan Tenggiri, in my selected gravy – Asam Pedas – before serving it piping hot. When I sit down for a taste of my Asam Pedas Fish, I’m glad that the restaurant has kept the gravy consistently good and just right to enjoy with steamed white rice. Another popular choice here must be traditional Sup Tulang Merah also known as Sup Gear Box, drizzled with sambal kicap (spicy dark sauce) and savoured with slices of French loaf. Then I discover two stalls that are serving something new: skewers of ingredients to dip into a choice of soup or spicy gravy, popularly known as Oden-Oden (Japanese version of food locally called Lok-Lok) and Mee Kolok Sarawak. At this noodle stall, I’m pleasantly surprised to see that instead of the serving staff, someone else is happily helping to prepare a portion of Mee Kolok. He is none other than the Resort’s General Manager, Sunny Soo! Mee Kolok is a Chinese specialty, popular in Sarawak and he is obviously having fun, trying his hand at cooking the noodles by dunking it into boiling water. I watch and give him a cheer when he skillfully tips the noodles from the strainer into a bowl where it is dry-tossed with special sauces and served, topped with minced beef. Guess who's cooking Mee Kolok? More family favourites are served from live-cooking stations including Kacang Pool, Roti John and crispy Murtabak besides Barbecued Caru Sumbat (stuffed fish), Teriyaki Sausages and Beef slices, Tandoori Chicken, Deep-fried Baby Crabs and another choice of Deep-Fried Baby Crabs in Salted Egg. In the hot buffet, dishes are presented from aluminum serving kwali/wok and one of the must-have items must be Daging Salai Masak Lemak Cili Padi. As its name describes, this delicious dish is prepared with sliced roast beef simmered in gravy, rich in coconut milk with a hint of zing from hot chili peppers. Other dishes to enjoy with steamed white rice are familiar items like Lemak Nangka (jackfruit) Daun Selasih, Nyonya-style Steamed Fish, Black Pepper Mussels, Chilli Prawns and Sambal Ikan Bilis Terung Pipit. But the dish that made me smile wider must be how a familiar chicken dish is being described. Its label reads: Ayam Masak Merah Orang Kahwin, probably to give credit to its popularity, especially as this dish is usually served at Malay wedding celebrations! To strike a balance with the meat items, there are piquant pickles, appetizing Malaysian and Thai salads in a variety of kerabu and a range of fresh local greens like ulam-ulam kampong to savour with a choice of traditional sambal sauces. No Ramadan buffet is complete without fresh fruits and a range of local desserts like sweet broths and tempting western desserts of cakes, pastries, jellies and puddings. One of the fun things to do at the buffet must be to assemble my choice of ingredients and top it with shaved ice to create my own Air Batu Campur or ABC and icy cendol. Here, the nostalgia of Ramadan is also reflected in old-fashioned but refreshing tubes of ice-lollies in various flavours, the kind that we used to buy from neighbourhood stores, fondly called Ice-cream Malaysia. The Buffet Ala Bazar 28 Hari is served at the Gleneagles Terrace from May 7 to June 3, from 6.30pm daily. Prices are RM99 nett per adult and RM49 nett per child aged 4 to 12 years. For every ten (10) paying adults, one dines Free. Advance purchases made before April 30 to dine between May 7 and June 3 will enjoy a special rate of RM84 nett per adult and RM42 nett per child. Pulai Springs Resort is located at 20km Jalan Pontian Lama, 81110 Pulai, Johor.